Vegan Eats and Treats! : Cookie Party! & Annual Cookbooklette Giveaway! Cookie Party! & Annual Cookbooklette Giveaway! 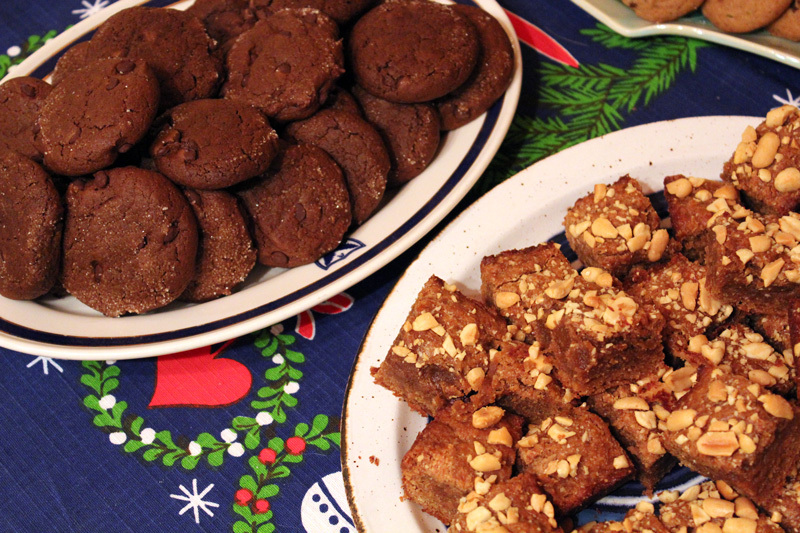 This weekend we hosted our annual Vegan Christmas Cookie Swap Party! You know those parties where everyone gets together to swap holiday cookies? And you know how you could never go, because none of the cookies would be vegan except your own? Well, my pals and I have solved that problem -- for years now, we've had a cookie party and it's great fun! One lesson we learned the hard way is that the cookie party needs to start off with a proper, super-healthy dinner. This ensures that you are comfortably full with yummy, nutritious food before you even approach the cookies. This also ensure that more cookies will make it home (for freezing or re-gifting), and fewer cookies will go straight to your tummy. I made a gigantic pot of Minestrone Soup. My friend Ms. A brought an absolutely delicious salad of chickpeas, roasted winter squash, sprouts, and garlic-ginger pumpkin seed dressing. That pumpkin seed dressing was totally amazing. And Ms. N brought along a wonderful grain salad with zucchini, chickpeas and preserved lemon - from "Salad Samurai." Without any coordination, this was a great combo of dishes! After our big dinner, we sat around and chatted and caught up, and generally relaxed while we digested for a bit. Meanwhile, Mr. VE&T went over and ate a few cookies. Later, when we were finally ready to do some cookie sampling -- we had made our tea and decaf coffee, we had our little cookie plates at the ready -- we headed over to the cookie table to survey our accomplishments. My friends and I have a nice potluck tradition where we each go around and "introduce" the dishes we brought. So, we were all standing there (politely!) describing the cookies we had made and waiting to sample them. Meanwhile, Mr. VE&T kept reaching in and grabbing cookies and going "mmm!" Ha ha! He's got some serious enthusiasm. At this point, my friend Ms. A whispered to me "you've gotta do a doodle of that!" Last year, it was my friend Ms. N who went crazy and made 5 different kinds of cookies. This year, I was that person. What can I say?! I am in full-on Christmas spirit mode this year! So, I'll start with the cookies I made, and then the ones my pals made. Where possible, I'll link to the recipes. This recipe is from Mihl's totally stunning (and free!) new e-book of Christmas recipes, Zuckerguss Zine. Check it out... I mean, really : Stollen Waffles?? I cannot wait to try that recipe. Also from Zuckerguss Zine. 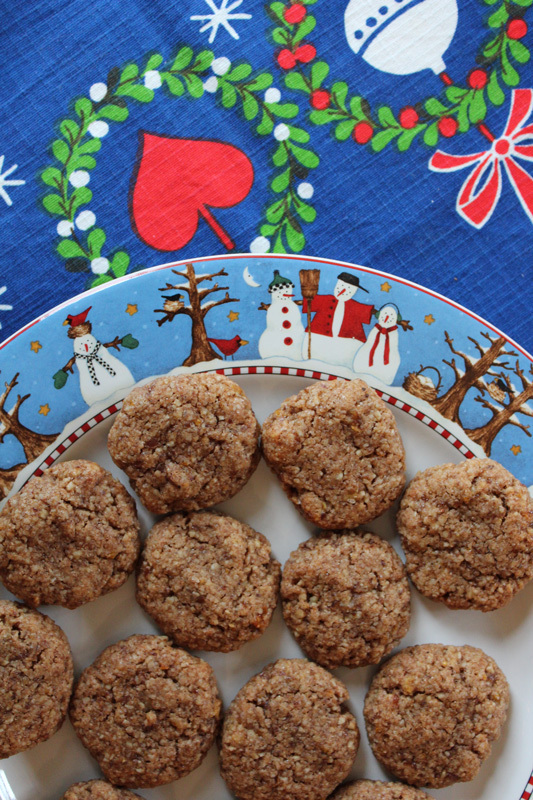 Oh my gosh, dear reader, these cookies are so delicious and not hard at all to make. Don't they look fancy and amazing? 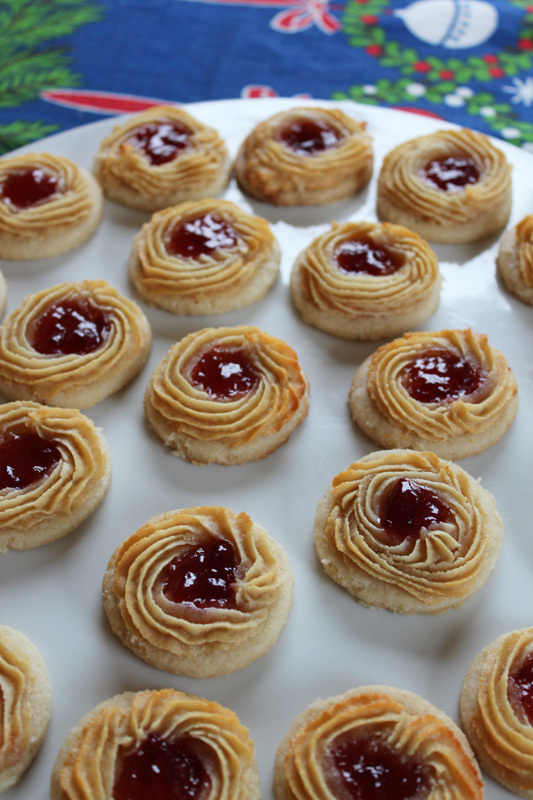 It's a shortbread cookie with a marzipan swirl and a dollop of jam. YUM. I used some plum jam that a friend gave me this summer, and it was great - just a touch tart and a touch sweet. Here is the recipe, also from Seitan is my Motor. Do you remember the candied lime and orange peel I made from "Vegan Food Gifts" last week? Well, I put those babies right to work in these cookies, and OH MY GOD. I think this might be one of my top cookies ever. So good. 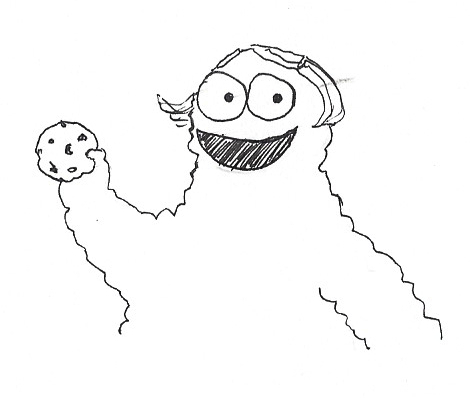 My pal Ms N took one bite of this cookie and her eyes rolled back in her head and she started swooning and decided to simply leave it at that and not eat any other cookies that night. Seriously, these are magical. Obviously, I totally groove on Mihl's cookie sensibilities. I have so many more recipes from her blog bookmarked, that I have yet to try. This recipe from My Darling Vegan caught my eye recently and I'm so glad I tried it. The cookies were easy to make, the recipe made a ton of (small) cookies, and they came out perfectly! They've got peppermint extract and crushed candy canes in them for some real peppermint pizzazz. I also added a touch of chocolate extract for extra chocolate power! This recipe is highly recommended. I really fell in love with The Oh She Glows Cookbook this year, so when I saw this recipe from Angela Liddon - featured as a guest post on the Keepin It Kind blog, I knew I'd like it. 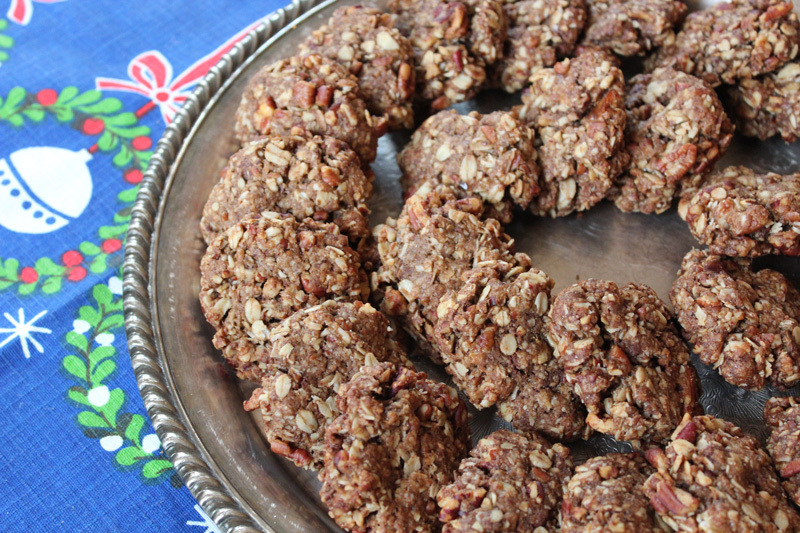 The cookies have dates and pecans and chocolate chips and they are hearty without being heavy - a perfect oatmeal cookie. I even accidentally left out ALL of the maple syrup, and then I thought to myself "this dough seems too dry" and so, fortunately I added a little bit of maple syrup... and the cookies still came out great. What a forgiving recipe! online cookie swap party last year. Check it out! So, like a crazed cookie elf, I made all those cookies. But happily, my friends made cookies too! Maybe you've heard about this surprising and delicious recipe - it's featured in Isa's most recent cookbook "Isa Does It," but you can also find the recipe (and a video!) here. I havn't yet made this recipe myself, so I was super glad that my pal Ms. K brought these. I was so curious about them. I'm a bit of an herb-i-phobe when it comes to sweeties, but I really did like these. I think when I make them, I'll probably reduce the rosemary just a touch, because of my sensibilities, but I was surprised by how much I liked them. Ms. K also brought along some delicious Chocolate Ginger Cookies - also from Isa Does It. Such perfect texture and flavor! Apparently they are supposed to have white chocolate chips, but we don't really have those available around here. Plus, is it ever possible to go wrong with regular chocolate chips? I don't think so. Ms. S brought Sourdough Peanut Butter Blondies. She presented them as a bit of an experiment, but I thought they came out perfectly - a great degree of density and cakiness (not too far in either direction), a great peanutty flavor that wasn't overwhelming, and I loved the big crunch of the roasted peanuts on top. Boy howdy, aren't these beautiful?? 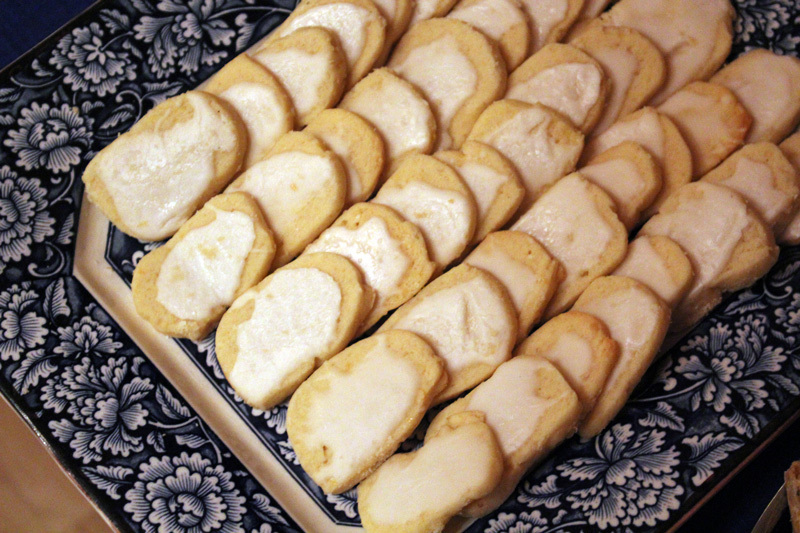 Ms. S also brought these super fancy cookies - two different kinds of Linzer cookies (some with raspberry jam filling and some with chocolate ganache filling), and graham cracker sandwich cookies with chocolate buttercream filling. Ooh la la! Aren't those little teddy bear cut-outs adorable?! 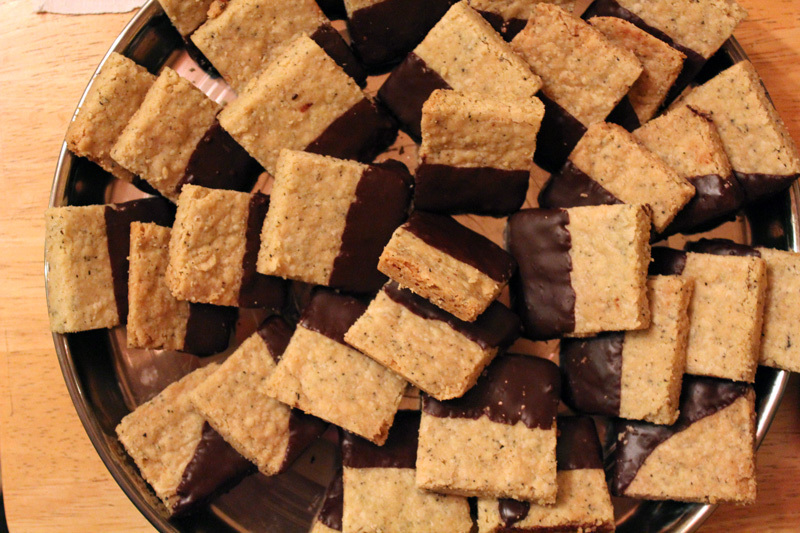 Ms. A brought these shortbreads and they were AMAZING. Perfectly delicate and crumbly, just the right hint of Earl Grey flavor, and the chocolate on just half the cookie was great. I gave my mom and dad a little sampler pack of cookies from this party and my mom was quite smitten with these. Ms N brought three different treats: first up, these lovely citrusy gems - based on the Grapefruit Icebox Cookies recipe from "Vegan Cookies Invade Your Cookie Jar." I had recently given her a bunch of limes from our lime tree - and look what she did with them. Yeah! I oughta give her limes more often! As much as I love chocolatey treats, I also have a life-long love of citrusy treats, and I was quite impressed with these. 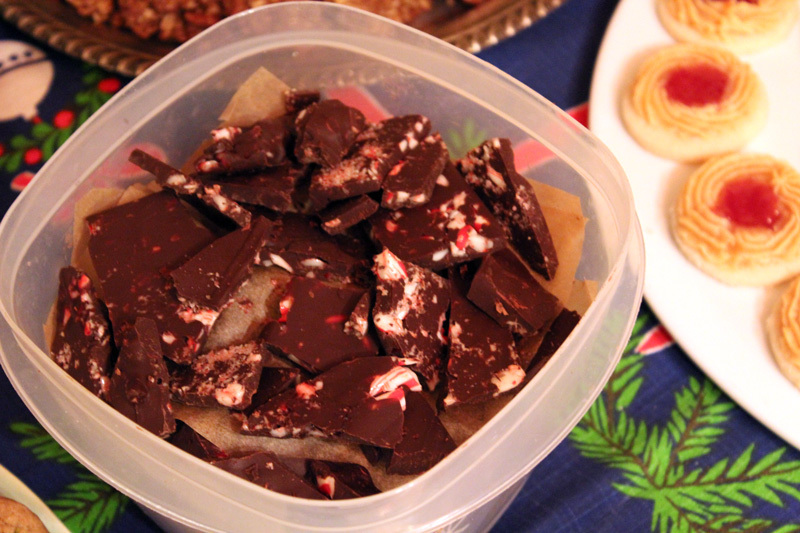 She also brought a sizeable batch of Chocolate Peppermint Bark, much to my delight. I think the chocolate + peppermint combo is truly one of my greatest joys in life. Why is it so magical? Best of all, Mr. VE&T isn't really that into it (fool! ), so it just means more for me. Mwahahaha. I think she said this was chocolate, peppermint oil, and crushed candy canes. It was the first thing I nibbled on, because I find it totally irresistible. Have you ever tried this recipe from Hannah Kaminsky? It was featured in the NYT a while back and it is totally superb. I've been thinking about this recipe, but hadn't made it since at least last year - and happily Ms N showed up with a cake pan full of them! 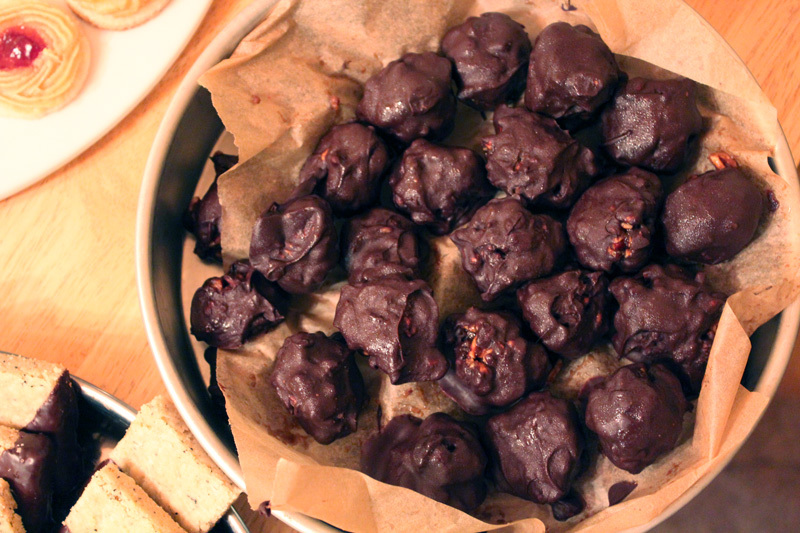 They are basically balls of pecans, bourbon and brown sugar - rolled in dark chocolate. They are crazy good - crunchy, boozy, and satisfying. So, as you can see - it was a quite a cookie party! Every single creation was absolutely delicious this year - no duds! Bit by bit, we are all improving our culinary skills - and the cookie party definitely shows that the proof is in the pudding. I've got a freezer full of cookies now. I'll share some with friends and my yoga students, and I'll definitely stash some away for future treats too. I like to have a little supply of sweeties on hand for my moments of need. Congratulations to comment #27: Jen English! Don't worry, even if you didn't win, I've got another giveaway for you! It's that time of the year when I give away TEN copies of my homemade zine. This contest is open to everyone, everywhere, all around the world! 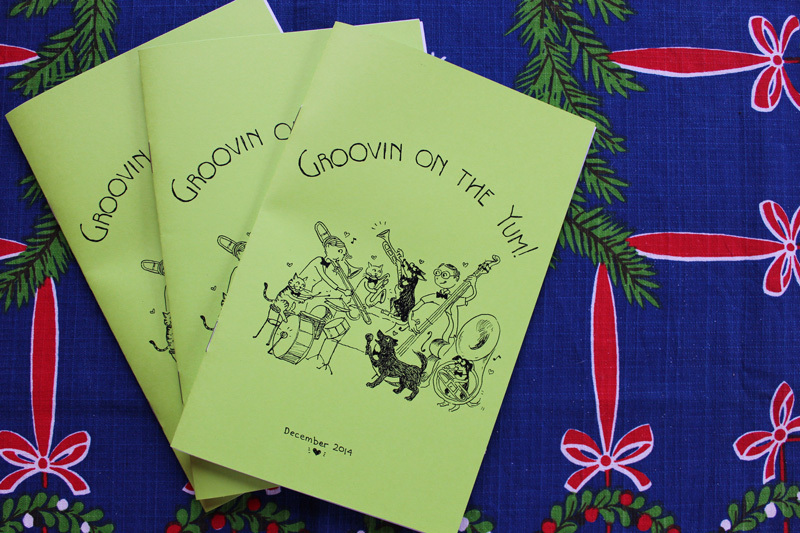 This little zine has recipes that I fell in love with this year (from various cookbooks and websites), along with lots of little cartoon doodles like the ones on my blog. To Enter: just leave a comment on this post and say some thing about this post, or about cookies, or christmas, or zines or whatever. Also, please make sure you leave your email address or that your profile links to your email address. If I can't easily track you down to notify you, I"ll just move on and pick another winner. I'll pick a winner next Friday, December 19th. Good luck! This looks like so much fun! I really need to get out there and make some vegan friends :) Love this! Oh, what a fun get together! You're so lucky to have fellow vegans in your life who are up for events like this. It looks like a great time! I'm glad you doodled the hijinks of Mr. VE&T. Too funny! I'm keeping my fingers crossed for this year's zine! Your cookie party sounds like so much fun! What a wonderful way to make sure you have a variety of treats stashed for a while... I really should take a day to bake a few batches of cookies! I don't really consider myself a "cookie person" - but these all look great! I have a few bookmarked to try! Also, your blog is great... it's refreshing and creative - and I always come away inspired. :) Thank you! Wow, thank you! I think you read my mind because I just couldn't decide on which cookies to bake this weekend and now I think I've got an idea. I adore your cute drawings and can never have enough cookbooks so I'd be super happy to win one of your zines! Your party looks so organized. Mine is always like a tornado hit since people come and go at different times. I also provide savoury stuff and a ton of raw veggies but I haven't done a full on meal thing yet. That's a great idea. thank you so much for the peppermint crinkle cookie link! 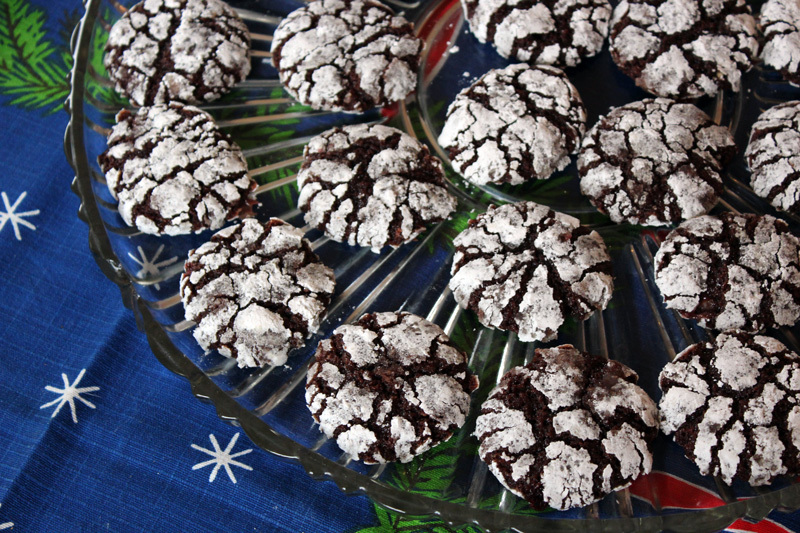 i make crinkles every year and this year i'll be trying this peppermint version! ohhh zines! Your zine class at VVC is still one of my favorite classes I took. 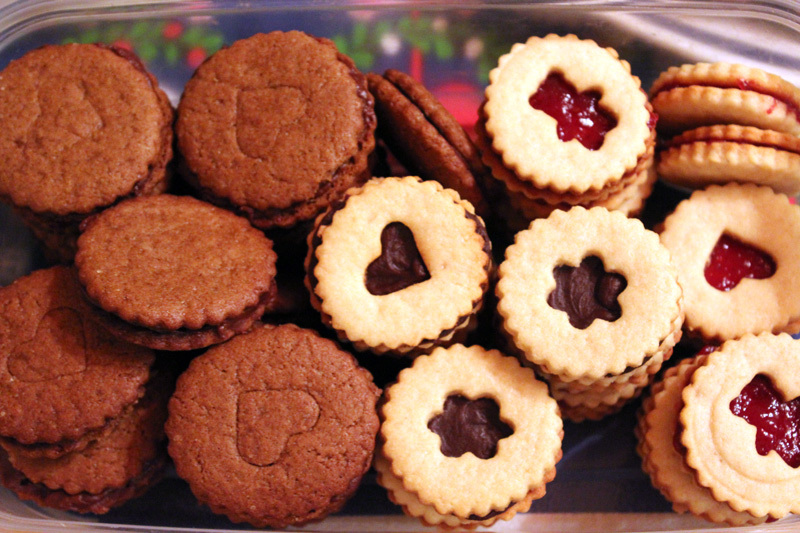 :) I definitely want to try out those Marzipan Jam Cookies. They are so pretty! Wow, this is amazing. It's like Keepin It Kind's virtual cookie party came to life. You've definitely inspired me to rally some friends together for a swap. Oooh, fun!!! LOOK AT ALL THOSE COOOOOKIES! My friend Cassi is hosting her annual cookie party tomorrow, so I gotta get in the kitchen early in the a.m. and bake 5 dozen cookies! And I'm also making Somer's cheeseball to take with me (after reading about it first here!). All of y'all's cookies look so good. Those little pb sourdough bars would probably be fave!! I love your blog, your annual zine, and your doodles! I need to get baking! Thanks for all the links- they all look delicious! I'm definitely going to make the turtle cookies! And try to make the earl grey shortbreads gf- wish me luck! Eat ALL the cookies! This sounds like such a great party. Those early grey shortbreads are calling my name! Officially entered. I use my Amey zines every year. I'm preparing to bake my agave spice cookies for an upcoming pop up shop. I also want to do something from Zuckerguss Zine, so I am eyeing your recommendations above. I would eat all of these in a heart beat! True story: I was so caught up in the spirit of this post that I got up from my computer to go get a cookie from our gift package! This time I chose the marzipan jam cookie. Excellent! Keep on bakin'. I am not usually into baking but I just bookmarked practically all of these recipes - what a creative & delicious assortment! Wow, Amey! What an awesome cookie party. I cannot believe you made all my recipes <3!! Your marzipan jam cookies look absolutely beautiful. But all those others as well. Graham cracker sandwich cookies and Earl Grey shortbread? I thought I was done bakeing but I think I am not. Wow! That sounds like a great tradition! I am planning on making my Christmas cookies next weekend and already have my recipes picked out but those marzipan jam cookies are calling my name! 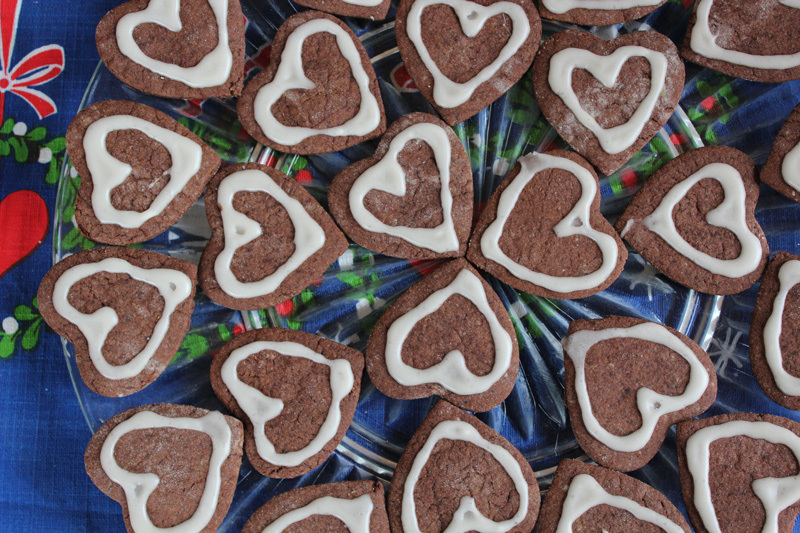 Maybe one of these days I'll host a vegan cookie swap too! This year I've been pretty un-cookie inspired. I only want to make veganized gingerbread men, but your cookie spread reminded me of the delicate butter rum cookies I use to make. I kind-of would love to give them a go! 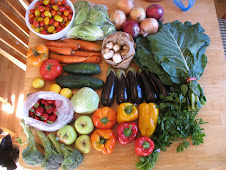 [ Smiles ] Wow, it looks like vegan Heaven; all of that delicious vegan food! WOW! I was just telling Jeremy I wish we knew more people in the area to have pot lucks you're are always so fun looking and WOW those treats looks amazing!! That booklet is so super cute!! Wow, what fun you guys had and what a beautiful meal and cookies! 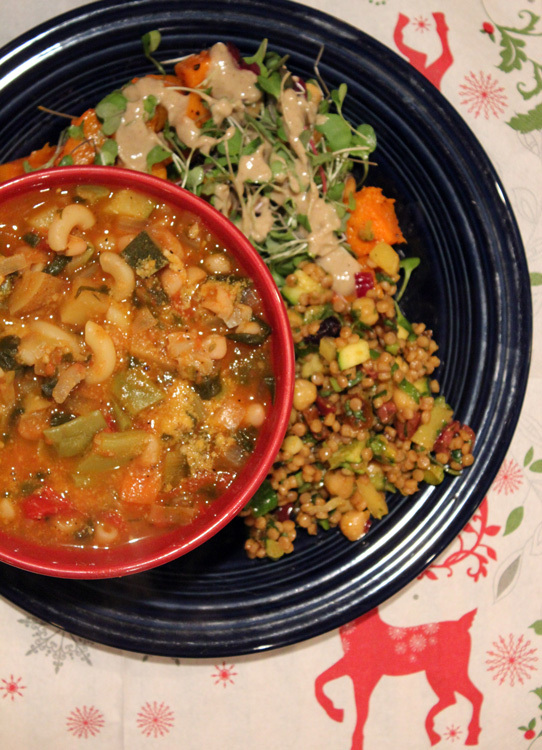 Will you be sharing your minestrone recipe? It looks wonderful. Happy Holidays! That Peppermint Chocolate Bark looks divine! And I must have you latest cookbooklette to complete my collection, you see. I haven't missed a single volume yet and really hope I get to see what you're up to this year, too. I might need to move to your area so I can come to your potlucks. They are always awesome! 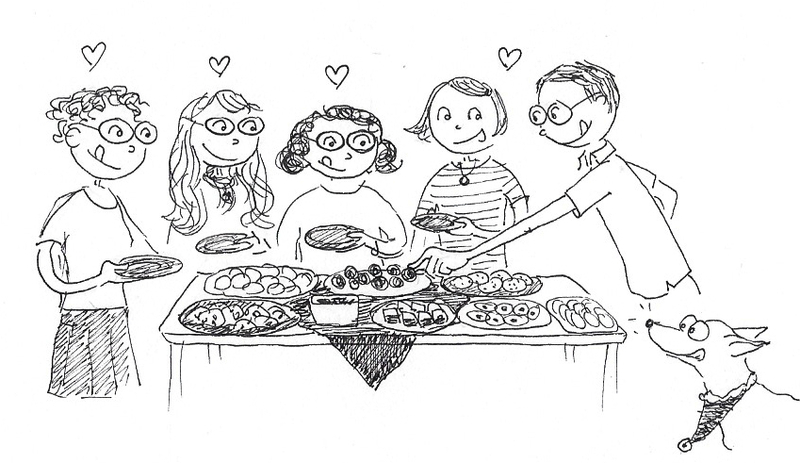 Your cookie exchange looks like so much fun (and, as always, LOVE the doodles!)! It's definitely inspired me to make Angela's Turtle Cookies very soon -- I love oatmeal cookies, and her recipes sounds perfect! 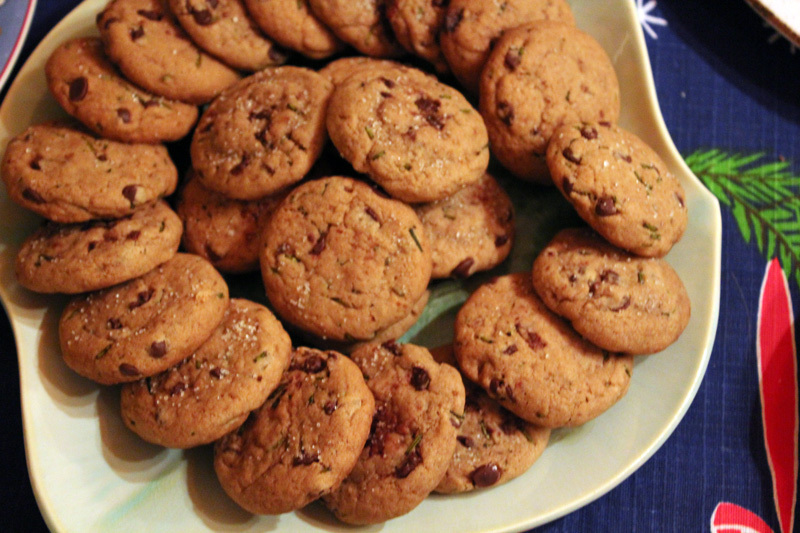 Thank you for linking to cookie recipes--they all sound great! Making cookies with my mom and sisters during the holiday, I always thought was OUR thing, never realized everybody else did it too. Thanks mom. Now I want some cookies!! I'm visiting my best friend across the country this weekend, and we just made mint-chocolate crinkle cookies today, too! It must be in the air. I'm a huge tea lover so I am super intrigued by those earl grey cookies! Every cookie (and your pre-cookie dinner) looks amazing! Cookies! 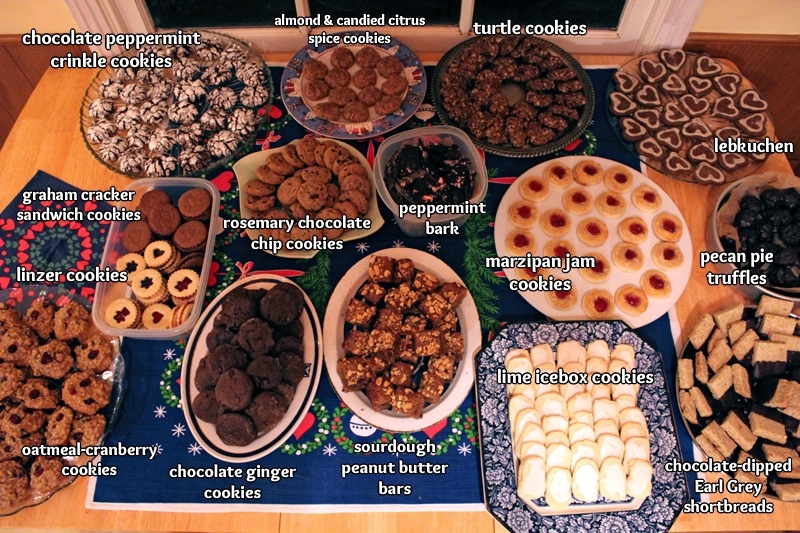 I would love to do a vegan cookie exchange. Oh well, I always make a bunch of treats for my husband's coworkers at Christmas just to share. Well, I also want to show them that vegan food is delicious! Your blog is a bright spot in my week - you always seem to have a positive, loving attitude towards the world at large. I appreciate all the energy you put into sharing with all us random strangers, I know a copy of your zine would keep me smiling in the kitchen! Argh, the internet deleted all I wrote! Anyway, I love your blog, it's always filled with so much positivity, something I strive to have more of. And I'm pretty jealous of you living in Cali! Right now, where I am, we have around 3 hours of "daylight"! I'm also a homemade gift kinda gal - this year I have made marmelade, candied peel, Christmas cookies and Christmas granola. In years past, I've even made berry infused spirits! I love your cookbooklette tradition! I'd love to receive one this year, thank you! I always get encouraged from your posts. I can do this, I can do this. Thank you for the making things look so "with my reach" and so beautiful. I also enjoy your doodles. Ahhhh the cookie monster Amey! Love it! I would love to receive that zine! I love chocolate and orange cookies during Christmas time, but I enjoy even more making a bûche de Noël.